Sir Malcolm Sargent's association with the Gilbert and Sullivan Operas dated back to the 1920s, when he was engaged to lead several of the Company's great London seasons of that period. He also conducted many of D'Oyly Carte's electrical recordings and was occasionally engaged as a guest conductor as late as the 1960s. He is one of the few mainstream conductors who cared enough about Sullivan's music to make the G&S operas a career priority. In the 1950s, the expiration of the copyrights on Sullivan's music, coupled with the introduction of stereo, gave Sargent the impetus to launch his own series of G&S recordings, with grand opera singers rather than D'Oyly Carte specialists in the lead parts. With the Glyndebourne Festival Chorus also involved, these came to be known as the "Glyndebourne" recordings, even though there was no actual connection to the Festival itself. The orchestra, dubbed the "Pro Arte Orchestra" for marketing purposes, was a pick-up group that had no existence outside of the recording studio—but they were probably chosen from London's best orchestras, and the sound Sargent elicited from them was some of the best playing the G&S operas have ever enjoyed on records. EMI 5744682, 16-CD set containing the entire Sargent/EMI series, plus various Sullivan orchestral works. Sir Malcolm Sargent is pictured on the cover. The series began, as one might guess, with The Mikado (issued 1957), followed by Gondoliers (1957), Yeomen (1958), Pinafore (1958), Iolanthe (1959), Pirates (1961), Trial (1961), Patience (1962) and Ruddigore (1963). Although there was no Ida in this series, Sargent was brought in by D'Oyly Carte to conduct their 1965 recording of the opera. In the first three recordings of the series the patter baritone parts were taken by Geraint Evans. Evans, fearing that close association with G&S would hurt his opera career, declined to participate further. He was replaced for the remainder of the series by George Baker, a fixture of the historical recordings who was by now in his seventies. I believe the mono and stereo issues in the Sargent series may have been assembled separately using different takes from the recording sessions. When the series started, stereo LPs had not yet been introduced, and there were distinct recording equipment set-ups staffed by different teams. Mono masters were put together for release some time before the stereo tapes were edited, possibly by different hands. Therefore, if you collect the mono and stereo versions of the sets, you may find yourself with somewhat different performances. 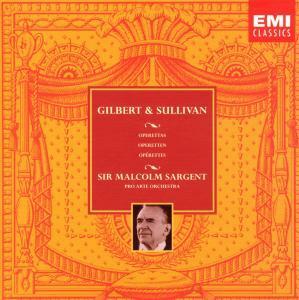 Sargent's stereo recordings of the Gilbert & Sullivan operettas, starting in May 1956 and finishing in December 1962, were recorded in both mono and stereo. The last of the series, Ruddigore, was recorded only in stereo only, as EMI had ceased recording in both forms from January 1962. The 1955 stereo recording of The Mikado was made initially as an experimental recording, balanced by Christopher Parker who was the Company's first engineer in this then new medium. He also worked on both the Gui recording of Mozart's Le nozze di Figaro and Frederic Austin arrangement of the Pepusch/Gay The Beggar's Opera during the summer of that year. Both have since been reissued on CD and sound remarkably effective nearly half a century on. Each recording crew worked in separate control rooms at EMI's Abbey Road Studios, initially with the stereo engineer in a room which had no sight lines to the studio. As time went on, the stereo medium assumed a greater importance than the mono and the venues were reversed. I worked on the October 1961 recording of Patience as the stereo stage manager, a role which involved moving the singers around the stereo stage (squares were marked with numbers to facilitate the operation) in addition to queuing in the person looking after sound effects. These were, incidentally, done at the time of the recording, not tracked in at a later stage. A description of how marked squares were used to create an aural picture was included with the original liner notes to the Trial recording; see that page. From Malcolm's account, evidently the technique was used on several recordings of the series. The Sargent recordings have persisted in the catalog since their introduction. No other series has been re-issued so often, in so many formats. All are available on CD, several with Sullivan's orchestral works offered as bonus tracks. The recordings' musical excellence is undisputed, but many listeners object to Sargent's lugubrious tempi and the singers' lack of feeling for the G&S idiom.